After being gifted a set of My Little Pony characters and book, my girls have been on a unicorn kick lately. 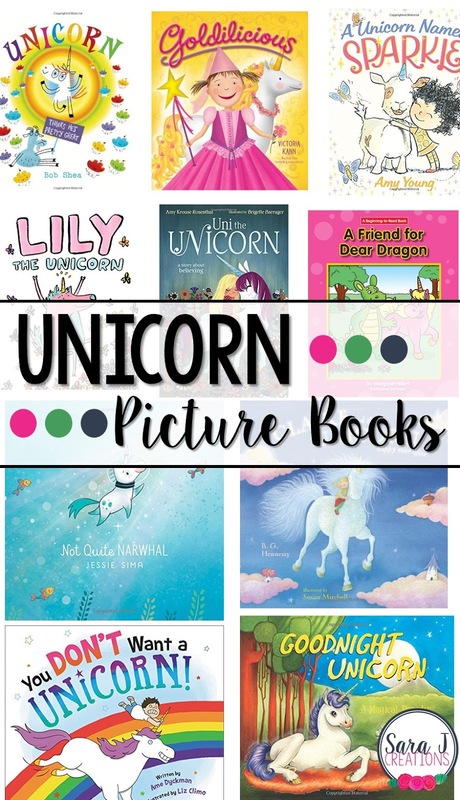 We headed to the library and rounded up all the unicorn picture books we could find. Here are 10 of our favorite unicorn books. Unicorn Thinks He's Pretty Great by Bob Shea is about Goat who is feeling inferior since Unicorn came to town. Then he realizes that Unicorn struggles too and has things he isn't good at. They bond over this and quickly become friends. Claire and the Unicorn Happy Ever After by B.G. Hennessy tells the story of Claire who reads a fairy tale book with her dad before bed. She wants to find out what makes them happy forever and her dad tells her to think about it. In her dreams, she takes her unicorn and visits with different characters we commonly see in fairy tales to discover what makes them happy ever after. Goldilicious by Victoria Kann is part of the Pinkilicious series. In this story, Pinkilicious has an imaginary friend that is a unicorn. Only she can see her and play with her but her brother tries to "play" in his own way. Lily the Unicorn by Dallas Clayton tells the story of Lily who loves making friends. She meets Roger the penguin and has big plans for them to do together but Roger doesn't want to make new friends. Each page is filled with lots of pictures and captions to help explain what Lily and Roger are thinking. A Unicorn Named Sparkle by Amy Young is all about a girl named Lucy who orders a unicorn from an ad. Unfortunately, the unicorn isn't what she expected and more like a stubborn goat. She decides to send him back but then they realize they are actually perfect for each other. Not Quite Narwhal by Jessie Sima is the story of Kelp, who was raised with narwhals but is a little different. He goes to the surface and discovers unicorns and realize he is a lot like them. He can't decide who to live with and identify with so he has a plan to give him the best of both worlds. Uni the Unicorn by Amy Krouse Rosenthal switches the typical role and storyline that you would expect. In this book, the unicorn is the one believing that little girls are real and that there is a little girl out there for her. Luckily, there is a little girl believing the same thing. A Friend for Dear Dragon by Margaret Hillert is an easy reader book where a unicorn moves in next door to a dragon and they quickly become friends. This book is full of simple sentences and sight words to make it easier for new readers to manage this book on their own. Goodnight Unicorn by Pearl E. Horne is a parody of the classic book, Goodnight Moon. In this version we are saying goodnight to mystical creatures like unicorns, trolls, and fairies. You Don't Want A Unicorn by Ame Dyckman is all about a little boy who wishes for a unicorn as a pet, but doesn't realize how much trouble unicorns can cause. I like that this one has a boy as the character, as most of the other unicorn books seem to feature girls.